Young people share the message of agriculture. This time of year brings youth indoors for competitions. In a few months, they will be outdoors working with their animals on a more regular basis. In the meantime, they are honing their other skills. Over the past few weeks, I have had the opportunity to watch and judge youth speaking contests. While a good voice is a strong component on a speech, there are different characteristics that make a good voice. Some may think of the very strong, deep, and direct voice of a leader as the best option. Yet, there were other presenters that did not have that booming voice, yet were effective. One young lady had a very calming voice, as if to invite you personally into her circle of friends as she discussed a topic. Was she loud enough, did she command the room, was she effective? Yes on all three, but quite different from her competitor. Another young woman had a sharpness to her voice, as if listening to it, she directed you to hear her message but without being overwhelming. One young man was quite charismatic and pulled you into his speech with the simple turn of a few words. While these are just examples of a few of the styles I witnessed, it reminded me that there is no right speaking style, as long as it is yours. While some have crafted their skill in delivery, we all have talents within our control to make our delivery effective. The youth programs I witnessed were part of an FFA speaking event and a state Holstein Association competition. The FFA program was Discussion Meet, which gives high school students the chance to mimic a committee meeting; bringing ideas to the table, discussing them (not debating them); and presenting their summations. At the California Holstein Association’s convention, youth competed in prepared public speaking contests. There was great participation at each event. In the prepared speaking contest, the younger ages showed greater participation than the older groups. It was encouraging to see young people starting on a path to communication early in life. When one adult addressed the group of Holstein enthusiasts, she asked how many of them liked to give speeches. More than a handful replied with a raised hand. At that age myself, I would not have raised my hand — I would have sat on both of them. But through programs that develop leadership skills, communication skills seem to follow. While not everyone likes giving speeches, they are a great mode of sharing our stories. As fewer people are familiar with life on a modern dairy farm, we need to share our experiences with them. And that can start at a young age. 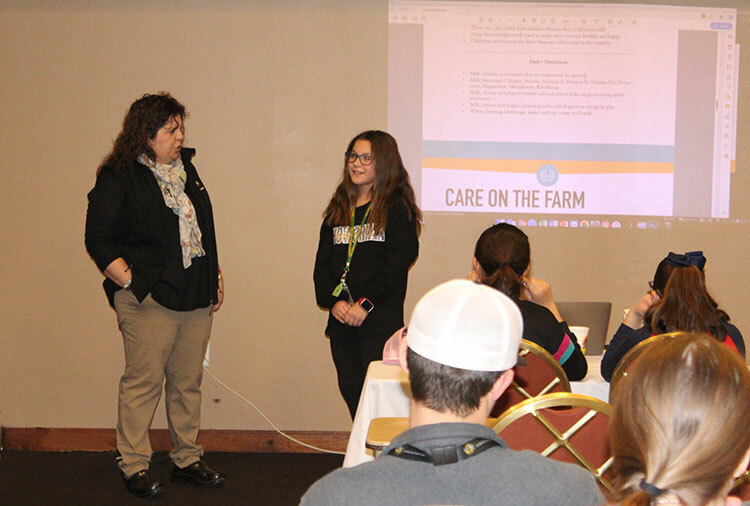 While most might think that social media communication and speaking about life on a farm is for the adults, young people (as young as age 9) had the chance to learn some of the basics of sharing their ag story at the convention. The presenter gave the example of being at a show and a fairgoer asks questions about the youth’s dairy animal. She asked for volunteers and a dozen hands went up. While she could not perform the scenario that many times, a few were able to participate. The youth learned sharing was a positive experience — not as a defensive or negative one. And the children were excited to do it! She reminded the group that not everyone is trying to find fault in their practices. Most people simply just want to learn about animal agriculture because it is so foreign to them. If there was a question that they did not know the answer, she instructed them to admit that they did not know the answer and refer them to an adult who could provide a response. Going forward, these brave young people will serve our industry, and agriculture well.